In this book, the author provides a critical examination and evaluation of a number of the central political questions currently being posed in urban studies. The book is divided into two interrelated sections. Part One critically discussed the theoretical problems raised by recent work in Britain, Europe and the United States and covers such issues as 'non-decision making' and the mobilisation of bias in political systems, the significance of owner-occupation as a basis for political action, the potential importance of 'urban social movements', and the nature of the relationship between urban management, the state and private capital. Throughout these chapters, the author attempts to develop a theoretical position which avoids the weaknesses of contemporary pluralist, Weberian and Marxist formations. Part Two systematically relates this theoretical discussion to an analysis of empirical material generated in a case study of an Outer London Borough. Thus, in addition to a chapter on local government policy making and the operation of strategies of political exclusion, this section contains analysis of political struggles involving suburban owner-occupiers, council tenants and large town centre business enterprises in a town which has undergone massive urban development over the last few years. 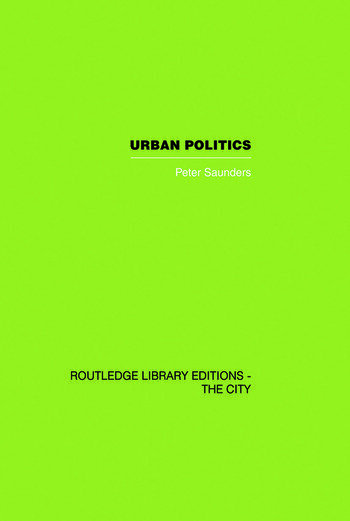 Taken as a whole, the book constitutes an original and challenging contribution, both theoretical and empirical, to the contemporary analysis of urban politics. This book was first published in 1979.